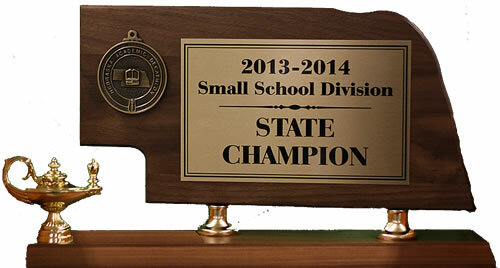 The Mount Michael Knights reign as the 2014 small school Academic Decathlon State Champions. The competition was held at the University of Nebraska Omaha campus. The topic this year was World War I. Schools of all sizes competed simultaneously. The final event was the Super Quiz. Mount Michael won the Small School division and placed 3rd among all schools. When the points were totaled for the entire event Mount Michael placed 2nd among all schools large or small. Congratulation Knights! In the competition each team is divided into 3 levels according to GPA. The three levels are Honors, Scholastic, and Varsity. Each level is then represented by 3 members of the team. Cameron Engel: Gold in Economics, Science, and Essay; Bronze in Art and Interview; 2nd overall Honors; team high score. Jonathan Collins: Gold in Language/Literature; Silver in Art and Science; Bronze in Music; 3rd overall Honors. Rowan Gruber: Silver in Economics. Zach Frevert: Gold in Math and Science; Silver in Economics, Language/Literature, and Music; 1st overall Scholastic. Alex Hotovy: Gold in Economics, Math, and Language/Literature; Silver in Art; 2nd overall Scholastic. Collin Donahue: Silver in Language/Literature and Interview; Bronze in Art and Math. Adam Terasinski: Gold in Art, Economics, and Essay; Silver in Language/Literature; Bronze in Math; 1st overall Varsity. Ben Connealy: Gold in Language/Literature and Science; Silver in Economics; Bronze in Speech; 2nd overall Varsity. Jacob Ramaekers: Silver in Science. For alternates, art and music are paired up as humanities; economics and language/literature are paired up as soft science; and math and science are paired up as hard science. Thomas Kalil: Gold in Humanities, Soft Science, and Hard Science. Andy Johannes: Gold in Humanities, Soft Science, and Hard Science. Caleb Pflug: Gold in Humanities, Soft Science, and Hard Science. 1st place for the Super Quiz: Jonathan Collins, Rowan Gruber, Alex Hotovy, Collin Donahue, Adam Terasinski, and Ben Connealy. L to R: Back row Dave Cormier, John Collins, Alex Hotovy, Cameron Engel, Rowan Gruber, Caleb Pflug Front row: Adam Terasinski, Jacob Ramaekers, Zach Frevert, Collin Donahue, Andy Johannes, Ben Connealy, Thomas Kalil.